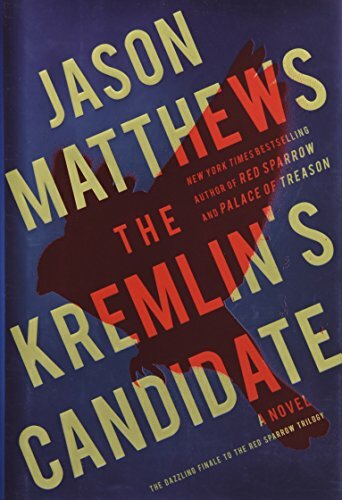 Jason Matthews’ The Kremlin’s Candidate is the finale in his Red Sparrow series. The story is very “today” with action and events pulled from current headlines. The story starts with a strong prologue set in 2005 when Lieutenant Dominika Egorova, a member of the SVR—Russian foreign intelligence service—seduces U.S. Navy Lieutenant JG Audrey Rowland for the sole purpose of turning the young lieutenant into a spy for the Russians. Dominika succeeds in her efforts and the die is cast. As the story moves into present day it is clear that Dominika has, herself, been turned to spy for America, (her CIA code name: DIVA). She is a synesthete, an accident of birth, that lets her read other people through the sensation of airborne colors that surround them. This is a condition that serves her well. Now in her mid thirties and moving toward the Russian glass ceiling in her pursuit of power and information, she must keep a close eye on those around her. Her American handler and lover, Nate Nash, supports her but wants her to exfiltrate and leave the spy business behind. His CIA bosses don’t agree, since the information she has been able to provide is considered invaluable to America’s cat and mouse game with Russia. It is early in the story when The Kremlin’s Candidate becomes obvious. It should be noted that this is not a spoiler, because the plan is made clear early in the book. Over the previous decade and a half, the Russians have dedicated time, training, and money to developing Audrey Rowland into a superspy, (code name MAGNIT) with exceptional results. Their final goal is to get her into the position as Director of the CIA—a role sure to benefit Russia. Of course, this will require eliminating the current CIA Director, at which the Russians succeed, making his death look like an accidental drowning. Three nominees are named to replace him, and must go through a thorough vetting, including naming DIVA—an occurrence that will surely end Dominika’s life. By this time, Rowland (MAGNIT) has obtained the grade of Rear Vice Admiral, and she is on the short list for this Directorship. Word seeps back to the CIA that there is a plan afoot to place MAGNIT into the CIA Director’s position; the problem is the CIA does not know who MAGNIT is. The CIA leadership recognizes that MAGNIT is likely one of the three candidates but the question remains: Who? As this is playing out, DIVA finds herself in the running to head the SVR, a role that will give her access to even more secrets to share with the Americans. The story moves forward like a Gordian Knot; there is no solution to untying that knot, short of just plain cutting it, and at the end that is exactly what the CIA does to uncover MAGNIT. Matthews creates a web of other problems, resulting in more CIA and Russian deaths and at times a confusing plot to follow. The spy meetings that are set up are confusing and lack detail. One of the most important scenes in the book is where DIVA discovers that Nate’s life is in jeopardy at the hands of Zhen Gao, a Chinese femme-fatale spy. DIVA takes it upon herself to eliminate Zhen, and it all happens in about three paragraphs. Matthews had designed Zhen as one of the craftiest spies in any government, and yet she is put down in short shrift. Not a satisfying scene. Matthews spends a lot of time with lengthy description, and overload of Russian words and phrases that require translation—all of this distracting from the story. It is the last 15% of the book that begins to ramp up into a good thriller. The ending of the story is perhaps not what the reader expects, but since this is the finale to the trilogy, the reader will not be surprised. The most unusual aspect of the story appears at the end of every chapter. In each chapter Matthews describes a food shared by the characters, and the very last thing in the chapter is a vague recipe of that particular item. Vague because the recipe is incomplete, and not likely to be reconstructed by the reader if he or she chooses to try it. Most unusual, indeed. On the whole, not a bad read once one gets through the half-details, sometimes unclear descriptions, story arc, and, yes . . . those recipes.